The Acoustic Guitar Records was founded in 2009 as a project of Franco Morone and Raffaella Luna with the intent of organizing courses and seminars for fingerstyle guitar, recording and CD productions, instructional books, management and artistic support for traditional and acoustic music events. 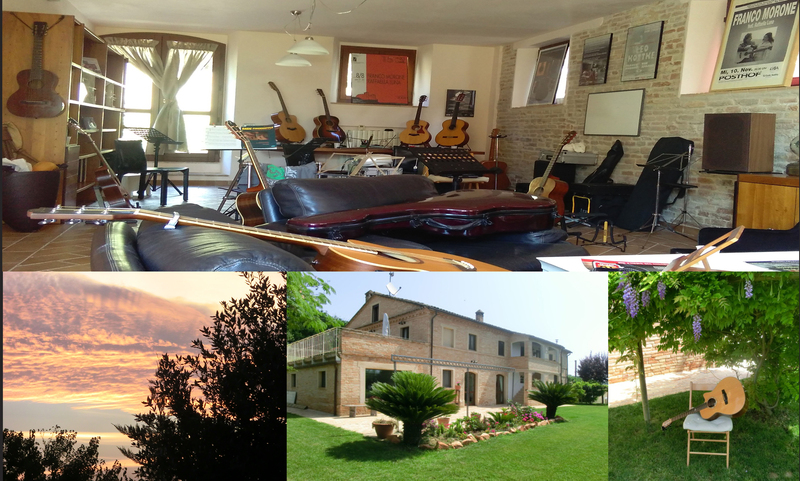 AGR headquarters is considered by many to be a magical place for the quality of services offered, immersed in the peace and quiet of nature, ideal for a variety of activities related to the world of acoustic guitar. The teaching of Franco Morone, over twenty years of experience, acquired over time prestige and visibility due mostly to many fans using his books and loving his music. Franco’s courses are attended by guitarists from all over Europe with varying levels of experience. There are several guitarists who, after master-classes with Franco, today held concerts and teaching. Click here for dates of upcoming seminars. In the Studio of Acoustic Guitar Records were born several recording projects as: Songs We Love, Canti Lontani nel Tempo, Miles of Blues and Back to my Best and took life collections and teaching methods as: Italian Fingerstyle, Basic Fingersyle, Ten Original Compositions and Fingerstyle Duets. Several are also guitarists who used the recording studio to give life to their musical projects. Hospitality. In addition to guitar lessons guests attending courses book also board and lodging. The house has different rooms, both single and double. The presence of carers in tow is permitted. At the bottom of the page you find tourist information about the surrounding area. Raffaella, knowledgeable and passionate about cooking, takes care of hospitality, serving authentic food made with raw materials, mainly coming from the farms of Musone Valley, favoring the ones putting more attention to environmental impact and human health. She prepares marmalades and cakes of irresistible lure. During guitar seminars she offers the possibility to carers in tow to follow the preparation of the dishes that will be served, as real cooking class, to be preferably requested at the time of course registration. There is a small recipe book detailing some of the dishes which are usually served for the occasion. The AGR is based in the Hill Monte Torto at Casenuove di Osimo (An) in a rural farmhouse of late’ 800 where there is a magnificent panorama of hills and mountains: to the southeast lies the Sibillini’s chain of mountains, southwest San Vicino mountain of the Umbria-Marche Apennines, located along the border between the provinces of Ancona and Macerata. In the south wall of the Hill extend vineyards, olive trees and other seasonal crops. Atop of Monte Torto there is the winery that produces wine and olive oil. AGR is just 7 km far from Osimo, an ancient village situated on a high Hill. The Adriatic Sea is 25 km with stunning sceneries as the Riviera del Conero, beaches such as Portonovo, Numana and Sirolo. Among the various surrounding towns Loreto is the seat of the homonymous Basilica gathering pilgrims from around the world, Recanati birthplace of the famous poet Giacomo Leopardi, Offagna, one of the most beautiful medieval villages of Italy, with the rock and its surrounding walls, Castelfidardo, known for the Accordion Museum, with its festival in September hosts musicians from all over the world. More internally in the territory there are the beautiful Frasassi Caves, one of the most impressive of Europe.